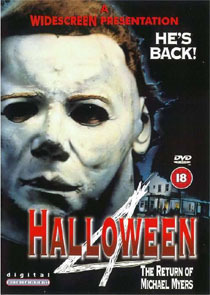 Halloween 4 is perhaps the best of the Halloween sequels, and seems more than usually spiritually connected to John Carpenter’s original. The fifth film is an altogether different matter, and demonstrates a bankruptcy of ideas, and an ill-judged move towards more overt humour. These two UK Region 0 Digital Entertainment discs are a considerable improvement on any VHS equivalent, but far from the standard you'd hope for from such recent movies. Both discs are presented in non-1:9-enhanced widescreen ratio of about 1.85:1. (Several sources credit The Return… as being shot in anamorphic Panavision, but, as the American version is also 1.85:1, there seems no reason to doubt the integrity of Digital’s version). The Dolby Digital 2.0 sound mixes are adequate, but better versions are available. These discs should be treated as obsolete - Anchor Bay has subsequently issued Special Edition versions (with anamorphic transfers and 5.1 audio).